Artesia's Old Fire Station #30 was official dedicated recently with a fitting tribute, ribbon cutting and community tours of the facility. Seen at the Ribbon Cutting were Artesia Mayor John Lyon, Artesia Historical Society President Barbara Applebury, Los Angeles County Supervisor Don Knabe, and Los Angeles County Fire Chief Daryl Osby. They gathered to honor real life heroes who helped save countless lives and to dedicate a “little fire station” that will forever serve as a monument for Artesia’s rich past and a symbol for the future. Old Fire Station #30, on the corner of Corby Avenue and 187th Street in the “heart” of Artesia was official dedicated after a massive restoration project that took thousands of volunteer hours to complete as well as an untold amount of tender loving care. With nearly 300 residents, community leaders, county fire department officials, and members of the Artesia Historical Society on hand, Mayor John Lyons oversaw a two hour program that took those gathered down a historical memory lane to recall the “enormous role” Old Fire Station #30 played in the lives of thousands of residents. Mayor John Lyon was beaming with pride and smiles as he recalled the amount of “team work” that went into restoring the fire station. “This was a true labor of love, and today we can all enjoy the value and importance this fire station has played in our history,” he said. Barbara Applebury, the President of the Artesia Historical Society praised Lyon and Los Angeles Counhe said. Joining in the ceremony included former Old Fire Station #30 Fire Fighters and living members of their families. Attending and speaking about their memories where Clark Miller, Greta Creedon, daughter of former fireman Joe Hakema , Steven Earl, son of firefighter Fred Earl, Joe Hakema Jr. the son of the late fireman as well as Rick Ings, son of fireman Fred Ings. Also attending were Ann Julian, daughter of Elmer Julian; Richard Willeford, son of Hogan Willeford and Lou Ann Zulawski, daughter of Fred Earl. Also performing at the event was the Artesia DES Band under the direction of Conductor David Costa. After its retirement from Los Angeles County, the building was sold and several other entities including an ambulance service and the former Artesia Chamber of Commerce, utilized the facility. In 2005 the City of Arteisa acquired the building and with restoration funding by both county Supervisor Don Knabe’s office, a major renovation was able to comment. 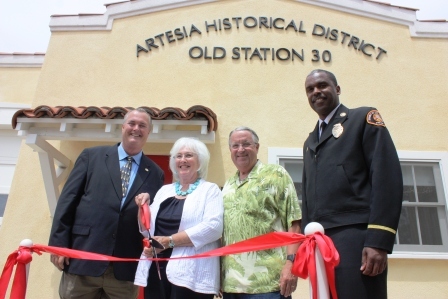 The opening of Old Fire Station #30 Museum makes it the second museum to the campus of the designated Artesia Historical District, which already included the Artesia Historical Museum also known as the Frampton-Dantema House located at the corner of Alburtis Avenue and 187th Street. Members of the current AHS Executive Board include Delores Eveland, Vice President; Maria Dantema, Secretary; Diana Padleford Young, Treasurer; Elaine Burdick, Executive Liaison; Jenny Kubinski, Resource Development; Ron Eveland, Museum Operations; Mary Lou Ormonde, Membership and Oral Interviews; Wayne Dantema, Archives and History, and Rosemary Economy, Community Outreach. Thanks Randy for the great article you did on the Dedication of Old Fire Station #30. The Historical Society appreciates all your support thru the years. Also,for showing up at our events with your camera and getting out the information to the community about both of our Museums/House and Fire Station #30.